The Hunchback of Notre Dame was getting ready to retire. He'd been the bell ringer for many years and it was time. So he put an ad in the paper, "wanted: Bell Ringer, Cathedral of Notre Dame, apply in person". After a few days a man arrived and asked Quasimodo for the job. Quasimodo looked him up and down and quickly realized the man had no arms. Quasimodo told the guy, "Look, I'm all for differently-abled people, but you don't have any arms! How are you going to do the job?" The man said in reply, "Oh Mr Quasimodo, please let me have the job! My family is so poor and without any arms I have a very hard time providing for them. I'm sure I can do a good job for you!" Well, the Hunchback was moved by the man's spirit so he said, "Okay, it's 1:00 - let's go ring the bell." They climbed together to the top of the cathedral and then approached the large bell. The man steadied his feet and leaned way back, then he quickly sprung forward and struck the bell hard with with forehead. "GONGGGG!" went the bell as it swung away and when it came back it stuck the still-dazed man and knocked him off the ledge and he plummeted to his death. Quasimodo ran down the steps and burst through the front doors to see a policeman was already standing over the body. The policeman said, "Do you know this guy?" Quasimodo said, "No, but his face rings a bell." Did you ever have the feeling? You see someone and you're sure you've met them before but you just can't place it? I'm sure you have, everyone has and it happens from time to time with watches too. For example, I recently came upon a watch in it's original box and with what looked to be an original bracelet too. I thought, surely I've covered this model on the blog already. I was wrong. Turns out it was one of the mysterious M-series models, although M is for Men, not mystery. What I had is, in fact, a 1962 M 79-2. There are over two dozen different M-series models to my knowledge. My theory on them is they were specially made for a large nation-wide catalog retailer, rather than for jewelry stores. Other than in 1964, you don't see them in the regular Hamilton catalogs. The M 79-2 is the second model to be sold at the retail price of $79. It's not clear how many years it was made but since it's not in the 1964 catalog it can be presumed to have only been a year or two. 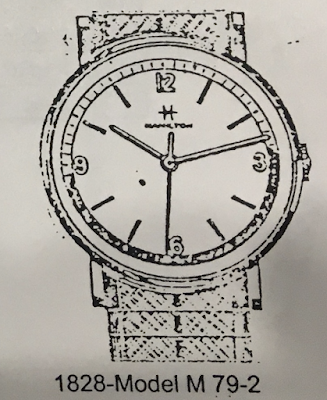 The M79-2 came in a 10K RGP case with a Hamilton 17 jewel Swiss-made 688 movement. As received it looks a little like the A-601 and the 1964 M 100-3 but they are automatics. The M79-2 is a manual winding model. I have seen empty red clamshell boxes from time to time but this watch would indicate the red boxes are for M-models. That would be a very interesting observation, if true. I'll have to keep my out for other red boxes and see if I can confirm my hypothesis. 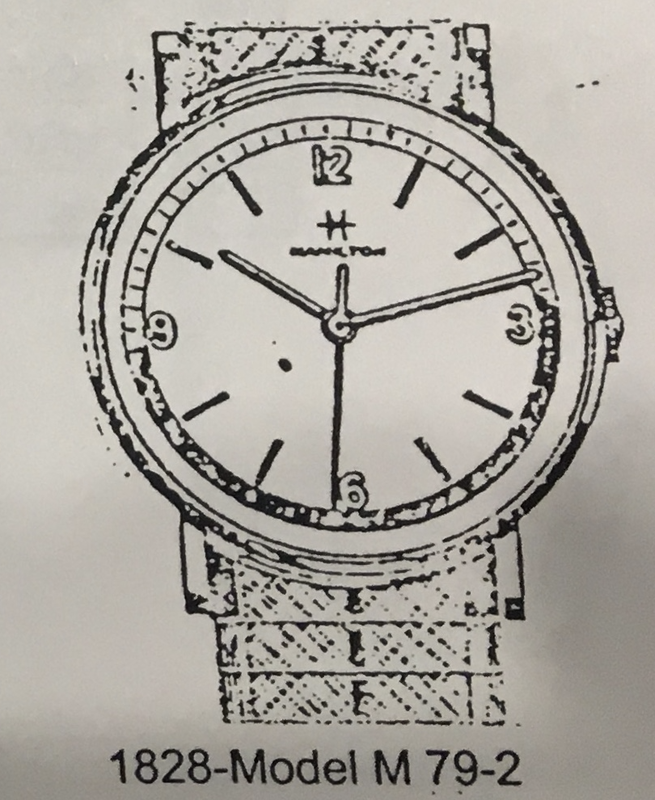 My project watch is definitely not new old stock. In fact, the back is engraved with a presentation and it has a bit of wear. However, I think the recipient must have really treasured this watch, to keep it with its original bracelet in it's original box. Interestingly, the presentation is from Jan 1965. Who knows how long it stayed in inventory though. If you look closely at the dial, it's very similar to the M 100-3. However, they are a bit different (beyond just the addition of the word AUTOMATIC). The silver chapter ring on the M 79-2 is flat while the ring on the M 100-3 is raised. The 688 movement is rust-free and in very good condition. It has a bit of extra oil inside though so it could stand to be cleaned. Sorry for the slightly blurry shot of the inside of the case back. There are a few past watchmakers' marks inside that indicate the watch was well cared for. This case looks very similar to the 1961 M79-1. All of the parts are cleaned and dried. The reassembled movement is noticeably brighter now that it's been cleaned. Although my camera has frozen the balance in time, it's actually ticking away on the timer with good motion. A new crystal will brighten up the finished watch since the existing crystal is a bit yellowed by the passage of time. This watch turned out fantastic! The bracelet shows a little wear but even with my merciless light tent the watch looks sharp. It's ready for some more wrist time, although it will be safely stored in it's original box when not in use.